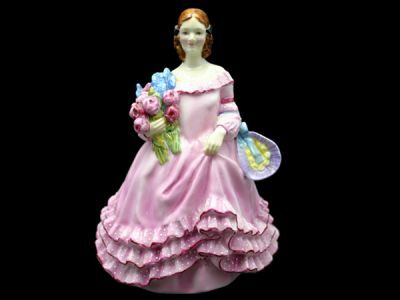 Royal Worcester Figure “June” is a lovely young woman holding flowers and a bonnet. Not of the Months of the Year collection, June is a rare figurine featuring fine detail and bold colour, modelled by artists Sybil V. Williams and Jessamine S. Bray in 1940. Design #2906 measures approximately 5” x 6.5”.